Conestoga Transportation Company Birney Safety Car 236 at the Manheim Historical Society. The Metropolitan New York Bus Association and the ERA welcome you aboard a comfortable Coach Tours bus for the MNYBA’s regular late Spring visit to our Pennsylvania Dutch country friends in Hershey and Shady Maple. Our first stop will be at the Museum of Bus Transportation in Hershey, where a huge collection of historic and modern buses are available for riding and photographing. A bus memorbilia flea market and lunch will be available at the museum. Our next visit will be to the Lebanon Transit downtown pulse point. 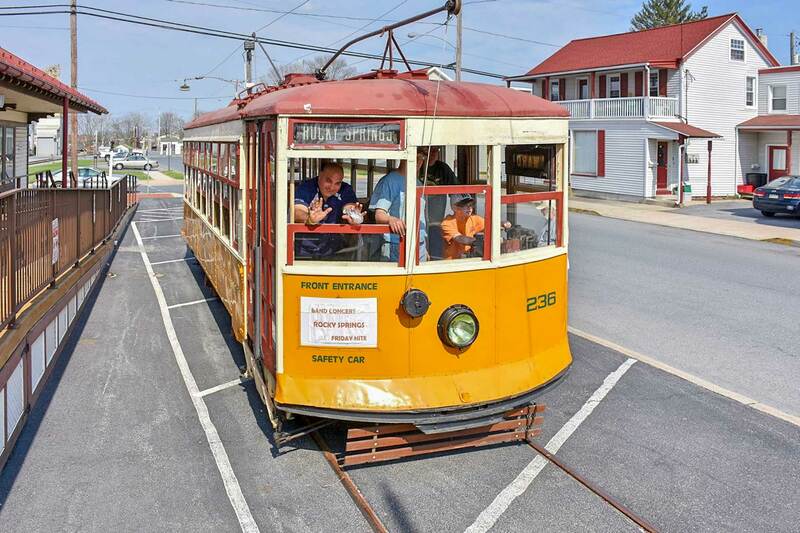 We also plan to observe the Manheim Historical Society’s small vintage Birney streetcar operation. We will end the day at the fabulous Shady Maple Smorgasbord restaurant in East Earl with its gut busting variety of food offerings! Join us for a great day in the Pennsylvania countryside with bus history and current operations, rail, and great food! Come with friends. The price includes fare, admissions and dinner. We expect to return to New York at 10 PM.